: Driving while distracted can result in loss of vehicle control, crash and injury. We strongly recommend that you use extreme caution when using any device that may take your focus off the road. Your primary responsibility is the safe operation of your vehicle. We recommend against the use of any hand-held device while driving and encourage the use of voice-operated systems when possible. Make sure you are aware of all applicable local laws that may affect the use of electronic devices while driving. • Status bars: This is the top and bottom portion of the screen. It displays the clock or date and other useful information, depending on which mode you are in. • Display area: The touchscreen changes depending on current system operation. Different buttons display in this area, depending on which mode you are in. : Some features, such as Sirius satellite radio, may not be available in your location. Check with an authorized dealer. A. I (Information): Press this button to access features such as Where am I?, Sirius Travel Link, Calendar, System Info and Help. B. PHONE: Press this button to access the SYNC phone menu. C. CLIMATE: Press this button to access the climate control menu. D. Eject: Press this button to eject a CD or DVD from the system. 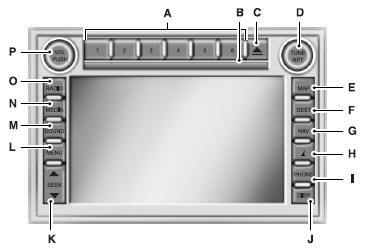 • In radio or satellite radio mode, turn the control to advance in individual increments up or down the frequency band to the desired station. • In MP3 mode, turn the control to advance to the next or previous folder. • In navigation mode, press this button to hear the last spoken navigation guidance prompt. F. DISP: Press this button to select a display mode: On, Status Bar Only, and Off. • Press this button to access the sound menu. • Press while the sound menu is active to access the menu tabs of Bass/Treble, Balance/Fade, SCV (Speed Compensated Volume), DSP (Digital Signal Processing) and Visualizer. • In radio and satellite radio mode, press the arrow buttons to find previous or next available stations or channels within the currently selected Category or Genre. • In CD and DVD modes, press the arrow buttons to select the previous or next track or chapter. • Press this button to access the media menu. • Press while the media menu is active to access the available sources of CD/DVD, Jukebox and User Device. • Press this button to access the radio menu. • Press while the radio menu is active to access the available sources of AM, FM1, FM2, SAT1, SAT2, and SAT3. K. VOL: Press and hold this button to turn the system off and on. Turn the control to adjust the volume. Note: If a navigation route is active when the navigation system is off, the system resumes the route when you turn the system on. • Store your favorite radio stations. To store a radio station, tune to the station, then press and hold a preset button until sound returns. • In radio and satellite radio mode, press a button to access your saved presets or channels. • Press this button to access the system menu. • Press while the system menu is active to access the menu tabs of Display, Clock, Feedback Settings, System Settings and Valet Mode. • Press this button to access the navigation map. • Press while the map display is active to center the map on the current vehicle position. Press while the map display and route are active to see the different map guidance views. • Press this button to access the destination entry menu. • Press while the destination entry menu is active to show additional destination entry techniques. P. NAV: • Press this button to access the navigation menu. • Press while the navigation menu is active to access the navigation menu tabs. Q. CD and DVD slot: Insert a CD or DVD, label side up. B. CD and DVD slot: Insert a CD or DVD, label side up. C. Eject: Press this button to eject a CD or DVD from the system. • Press this button to access the navigation menu. H. I (Information): Press this button to access features such as Where am I?, Sirius Travel Link, Calendar, System Info and Help. I. PHONE: Press this button to access the SYNC phone menu. J. DISP: Press this button to select a display mode: On, Status Bar Only, and Off. P. VOL: Press and hold this button to turn the system off and on. Turn the control to adjust the volume. : If a navigation route is active when the navigation system is off, the system resumes the route when you turn the system on.